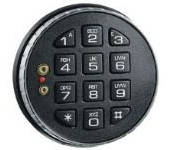 The Basic is a flexible entry lock, with interchangeable locks and keypads offering a multitude of choices. Swing bolt, deadbolt and spring bolt lock designs are available with this series. The Basic provides both affordability and dependability second to none.